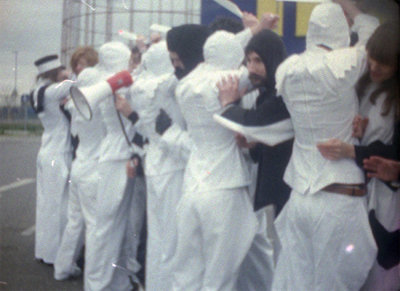 Join us for a lunchtime talk with Pil and Galia Kollectiv in conversation by Jamie Stevens, curator at Cubitt Gallery. Please join us now for a lunchtime talk with Pil and Galia Kollectiv, who will be joined in conversation by Jamie Stevens, curator at Cubitt Gallery. Pil and Galia Kollectiv are London based artists, writers and curators working in collaboration. Their work addresses the legacy of modernism and the avant-garde. Testing the boundaries between art and propaganda, they explore overlaps between the discourses of business management and political and artistic manifestos. They are especially interested in the role of art and creativity in post-Fordist labour and their films and performances often use choreographed movement and ritual as both an aesthetic and a thematic dimension, juxtaposing consumer rites and religious ceremonies. They have had solo shows at Te Tuhi Center for the Arts, New Zealand, S1 Artspace, Sheffield and The Showroom Gallery, London. They have also presented live work at Biennials in Montreal, Berlin and Herzliya, as well as at Kunsthall Oslo, Arnolfini, Bristol, Late at Tate Britain, Radar Loughborough, HKD Rijeka and ICA London. They are contributing editors at Art Papers and directors of artist run project space xero, kline & coma. They work as lecturers in Fine Art at the University of Reading. Jamie Stevens is curator at Cubitt Gallery, where his programme has included exhibitions by Jana Euler, Michael Dean and Roman Vasseur. He co-founded publishing project Benedictions and was formerly Exhibitions Organiser at Chisenhale Gallery.